The Windows Start menu returns with Start8! Attention Windows 8 Users! Want to completely get rid of the Windows 8 Metro and get the Windows 7 orb back? 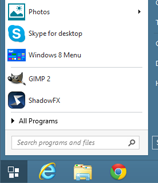 When you click on it you get a Metro-esque Start menu from where you can search and access other settings.